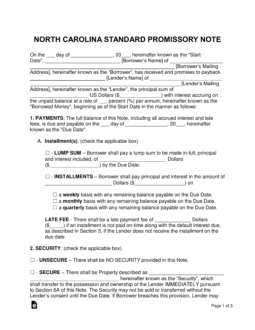 The North Carolina promissory note templates are documents designed to assist the lender in a money-lending transaction with earning his or her money back (with the addition of interest) from a borrower in a timely fashion. Sections of the agreement like Late Fees, Interest Rates, and Acceleration help motivate the borrower to ensure all payments are made correctly and in full. 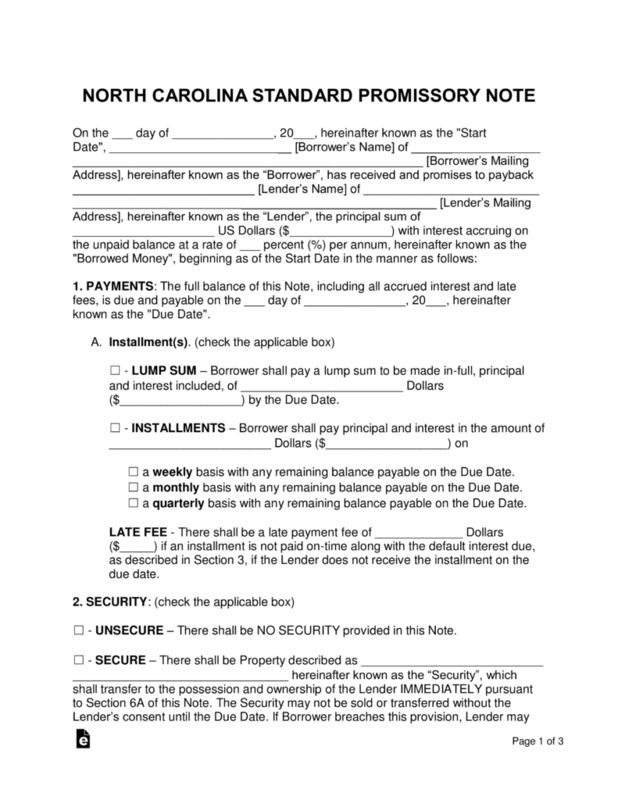 Secured Promissory Note – The secured version of the template includes a section on security. Security requires the borrower to set aside an item of relative value to that of the loaned amount of money. This item is given to the lender if the borrower enters into default to help cover the remaining outstanding balance. Unsecured Promissory Note – The unsecured version does not include a section on security, substantially increasing the financial risk for the lender. This is because the lender is not guaranteed a reimbursement on his loaned money if the borrower fails to pay back the balance. We recommend the lender in the agreement to only work with family, friends, and those with a strong credit score.